DLA constant-power laterolog is one main methods of resistivity-logging ,it include :a short section of insulation, electronic circuits, pressure-balanced glass probe and the lower electrode (can substitute by the shell of other logging instrument shell) . DLA dual lateral logging adopt the CSU-Dual-Lateral technology ,so as to be ataached with 3700 or 5700 systems directly , and can complete combination-logging; can provide Two different-depths lateral resistivity measurements datas. then cooperate with other logging datas, can accurately Distinguish permeable horizon , oil/water horizon , identify and evaluate the properties of oil bearing stratum. 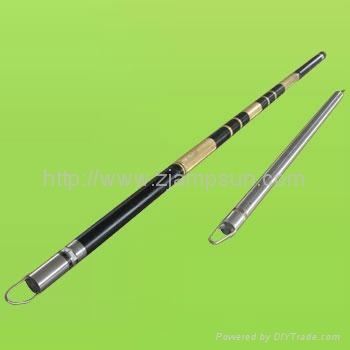 this instrument's electrode is made of stainless steel and have glass insulating sleeve , with anti-corrosion, durability and other characteristics, suitable for a variety of stratigraphic logging, and could be disassemble easily ,is easy maintenance. ● Repeat relative error: not more than 10%.